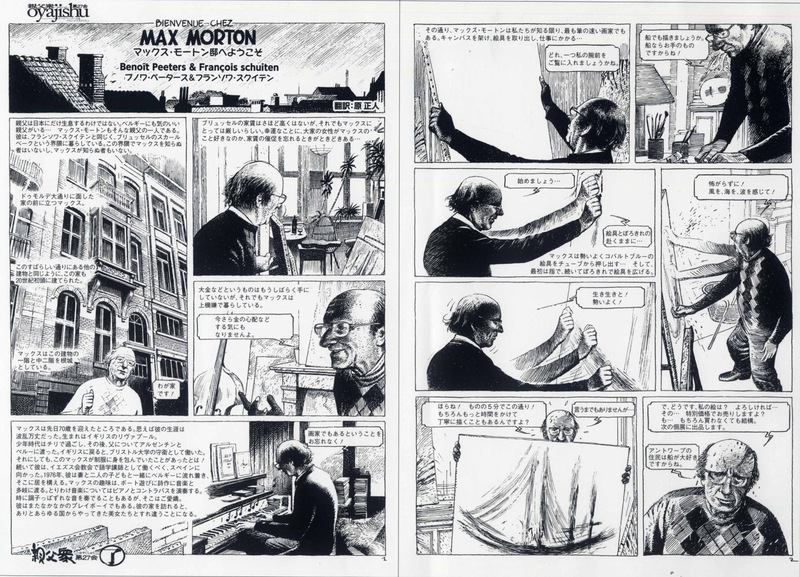 Bienvenue chez Max Morton is a two page story about Max Morton published in Ultra Jump in Japan in 2013. 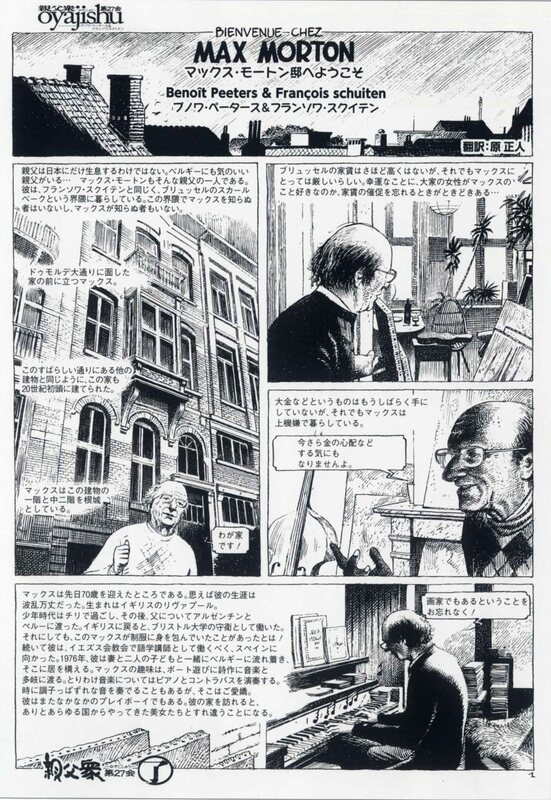 In Belgium , the older men are often friendly … For years Max Morton lives in the same neighborhood as François Schuiten in Schaerbeek, one of the municipalities of Brussels. Max knows everyone and everyone knows him. Here is Max at his house in Avenue Eugène Demolder . The building dates from the early twentieth century, as most of this beautiful street. Max lives on the ground floor and the mezzanine . Money is not something that Max got a lot. But that did not prevent him from being always cheerful . MAX : C’est pas maintenant que je vais commencer à m’en faire quand même ! Max just turned 70. His life was not easy. He was born in England, Liverpool. He spent his childhood in Chile, then followed his father in Argentina and Peru. Returning to England he became military attache at the University of Bristol. Yet we can not imagine him very well in uniform! Then he left teaching languages ​​in Spain, among Jesuits . In 1976, he arrived in Belgium with his wife and two children. And stayed there . Max loves boats , poetry and music. He plays the piano and bass. And even if the instruments are out of tune or a little saggy . He is also a great seducer of beautiful women. You can see him with a lot with them, coming from many different countries . MAX : Do not forget to say that I am a painter ! MAX : Well, I'll show you how I make a painting! MAX : I 'm going to paint a boat. You'll see the vessels , they know me ! 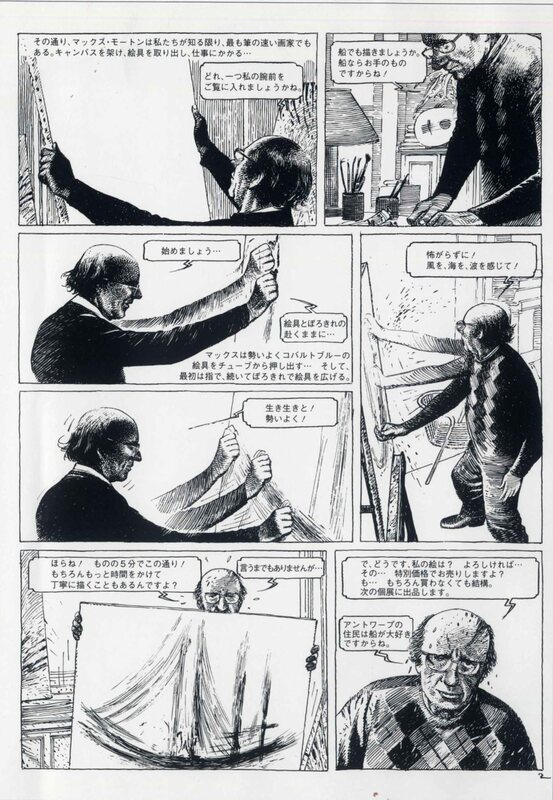 Max press hard on the azure tube … He first spread the paint with his fingers, then with a cloth. MAX : Do not be afraid ! We have to feel the wind, the sea, the waves! MAX : So there… you like my painting? If you bought it , it will have a friendly price ! Otherwise, it does not matter I'll keep it for my next show in Antwerp. They like the boats.